I have been trying to find the right time and frame of mind in which to write my birth story as I truly learnt the meaning of “I will calmly meet whatever turn my birthing may take”. Things were finally going ‘right’ for my pregnancy. I was violently ill for the first half of my pregnancy, in and out of hospital with Hyperemesis Gravidium and when the right combination of medication started working, I began to research how to have the best birth possible. I was given a place in the birth centre at RBWH and I undertook the Hypnobirthing course. I religiously listened to the tracks with my husband, practiced the affirmations and breathing and began researching a doula for birth support at home and at the birth centre. I even had regular chiropractic care to help my baby turn into optimal position and to prepare my pelvis. 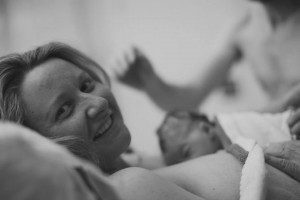 I had prepared an amazing birth plan to suit the natural, gentle birth I wanted. I was confident! My body was ready and my mind was ready! The first sense of things not going to plan was the two due dates – mine based on LMP, and the hospital’s dates based on scans – 6 days difference. Their date said mid December, and mine said late December. Of course, it didn’t seem like a big deal until the hospital’s date passed (no baby) and my date passed (no baby). I had researched and read every book on pregnancy and birthing, and I was very well informed on the risks of ‘going over dates’ and different induction procedures. I was quite stubborn ” there was no way I was having an induction. At 7 days over my date (13 days past the hospital’s date), we went in for a chat with the midwife and I reluctantly agreed to a stretch and sweep (the first rule broken of my “no exams” birth plan), as this seemed like the least invasive of induction options. I was still so confident that my birth would happen at any moment and we left thinking that ‘over the weekend’ I’d go into labour, and we made an appointment for the Monday for a ‘pretend induction’. On the Monday – December 30th ” (10 days past my due date, 16 days past the hosp date) an obstetrician gave me the ‘serious risk of stillbirth’ talk and wanted me induced that day. I booked one in for the 31st instead and agreed to one more stretch and sweep to get things moving. My cervix was already 2cm (another rule on my birth plan broken “don’t tell me how far along I am”) and I figured that THIS TIME I would finally go into labour. I was also told that I wasn’t allowed to birth in the birth centre anymore because the hospital wouldn’t recognise my date (even though they did before). Meanwhile with every passing day, we were trying every ‘natural induction’ method we could find. With so much pressure from medical professionals (and family members!) I was a mess of emotions and feeling dreadful. 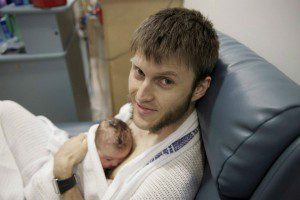 I woke up on the 31st and called the midwife – I organised for a scan to put my mind at ease to check the amniotic fluid and umbilical cord flow. Everything was fine so I put off my induction one more day to the 1st of January 2014. (Lucky I did – there were 13 babies born before midday on 1st of January at the RBWH!). My husband and I spent our last new year’s eve listening to relaxation tracks and going to bed early. I woke up on the 1st with no baby! My husband was amazing and managed to find an acupuncturist open – so off I went for a last minute ‘induction’ from the acupuncturist. Nothing happened that day, and at 7pm that night we (my husband, doula and birth photographer friend) headed into the hospital and after monitoring I was given prostin gel at 9pm. After some more monitoring, I was taken to the ward and I had to say goodbye to everyone as I wasn’t in active labour. Saying goodbye to my husband was difficult. I had imagined going into labour at home, and going through early labour in my safe space with my husband. It’s important to let go of what you thought your birth was going to be like, in order to accept how it will happen. On the ward was noisy – three other beds occupied with women and their newborns. I put my earphones in and listened to the hynobirthing tracks with my eyes shut and my head buried in my pillow (thanks to my doula for the tip of bringing my pillow from home – familiar smell and feeling helped me feel a bit more comfortable). At around 12.30am on the 2nd of January I woke up with a sore lower back. I got on all fours to “stretch it out” as I figured it was from the hospital bed. I got up and walked around a little, pacing back and forth, then back on the bed to stretch. It didn’t occur to me that I might be in labour! A few toilet trips, with lots of pacing about and trying to get comfortable on the bed, I got up in a huff and paced down to the main corridor. A nurse walked past. “are you alright?”. I explained that my back hurt, and she took me back to bed and felt my bump. After a minute or two she said “why don’t you hop in the shower?”. I still didn’t really think I was in labour! It was around 1am, and the feeling of hot water hitting my back and belly was amazing. I lay on the floor and surrendered to the feeling of each surge. I knew I was in labour and I could do it – I felt in control, and calm and powerful. At 2am, things were getting more intense and I asked for my husband to be called. The nurse took me back to the bed and had to check my dilation (4-5cm) which meant that I could be transferred down to the birthing suite. At 2.20am, my husband and photographer friend arrived, and we went down to the room. Because the birth centre midwife was busy with another labour, I was assigned a birth suite midwife who I hadn’t met before. I went straight for the shower again in the new room, but soon after going in I was told I needed to be monitored and to come back to the bed. I needed to lay flat on my back with the monitors strapped to me and I was in pain and not in the same headspace I had been in before! My husband put on the relaxation music and I barked at him to turn it off! My midwife also kept talking to me during surges! (also not on my birth plan!) The monitors barely worked and I kept getting told to lie still (another part of my birth plan broken “freedom to move” was gone!). Shortly after my doula arrived and helped get things calm again. She got me up on the fit ball leaning on the bed with my head buried in my pillow. She held the monitors in place while I rocked and swayed. The mood changed and I went ‘inward’ again. My husband and friend put up birth affirmation pictures on the walls to look at when I opened my eyes. What helped the most was having someone vigorously scratch and rub my lower back during surges – I was trying to recreate the feeling of the shower head on my lower back. At around 4am someone new in the room told me that I needed to have my waters broken. I declined – but was told that this way a monitor could be put on my baby’s head, which would give me freedom to move around, and also peace of mind that my baby was doing okay. I agreed, and when my waters were broken they were thick and greeny black with meconium (which we expected – but indicated the mec had been there a few days). The monitor was placed on baby’s head and the heartbeat was strong and steady. I remember being restless and cranky, and asking for help – I felt completely out of control and very strange – my doula reminded me that I was in transition and everything was okay. I felt strong urges to push around 5am and I was told I needed to breathe through them as I wasn’t fully dilated. I found making noises (humming and ahhhing) helped, as well as counting my breaths during surges. At 6am I was told I could ‘push’ – this was difficult and I tried lots of positions on the bed – laying on my side worked best. I found visualising my diaphragm and pushing all my energy down through here helped. I made lots of noise during this part – it was a very primal experience. A shift change meant that a birth centre midwife arrived to see the last half hour of my birth which also helped change the mood. The head took its time and gently came with each surge. Finally, the head emerged, and after one more surge the rest of the body came – born at 6:57am. 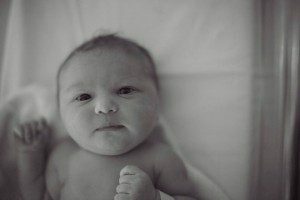 While we wanted delayed cord clamping, (another part of our birth plan that didn’t happen!) our baby came out thick with meconium and the midwife saw how much was in her mouth. Our daughter was taken quickly for suctioning (we were told afterwards that a significant amount was taken from her nose and mouth) and after 30 seconds brought back to my chest for skin to skin. A beautiful scrunchy and wide eyed girl stared up at me. She was so alert and calm and I couldn’t believe the 5 hours and 10 minute active labour I had just had with no pain relief. 3.8kg of beautiful baby girl we named Genevieve. She was +12 our dates, and +16 the hospital dates. With so many things “not going to plan” and not having continuity of care, I am so thankful for having my doula Cheryl Sheriff to support me and my husband before, during and after the birth. I consider hypnobirthing to be one element of the “tool kit” that helped me and my husband through our birth. I feel like hynobirthing taught me how to go inside myself and find a safe mental retreat (which is SO important in birth – it’s all about your mind and headspace and how you react to the intensity of sensations). However, having good physical birth support in the room was also key to having a supported and successful birthing experience. I still had what I consider to be a ‘good birth’ as I was able to birth my daughter at my own pace (with a little nudge from prostin gel). While we could have waited another day or so to see if things would happen, I am happy that our birth went the way it did, and that we have a healthy daughter to show for it. The photographs are from my photographer friend Mika Bryant and show the emotion of the day. p.s. I just wanted to add that my husband and I both used the relaxation tracks very often (daily ” numerous times during the day sometimes), and have continued to use them after the birth of our girl to calm/get to sleep. We also got into Christopher Lloyd Clarke’s relaxation music as well.